No, this is not an article resulting from frustrations in my quests for Lion Knights’ castle or Inter-City train – although it does have root in both of those projects. This is my attempt at documenting some of these faux pas, so others (or my forgetful self) won’t have to repeat them. If you are looking for help in hurting your LEGO may I suggest a microwave oven? 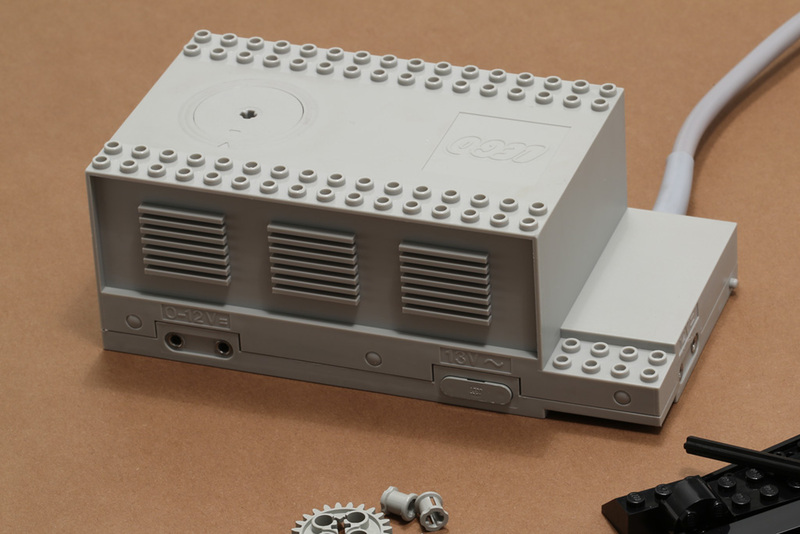 Oh wait, LEGO toasted the microwave there… Yes, LEGO is pretty sturdy stuff. But it can’t handle everything. Especially when discussing older LEGO pieces, aging, wear and tear, and cleaning needs – in many cases rarity of the pieces also – put an added emphasis on care and maintenance. Here are five ways I have managed to hurt my LEGO pieces and some suggestions on what not to do (again). 1. Older LEGO can be brittle, especially when damaged. 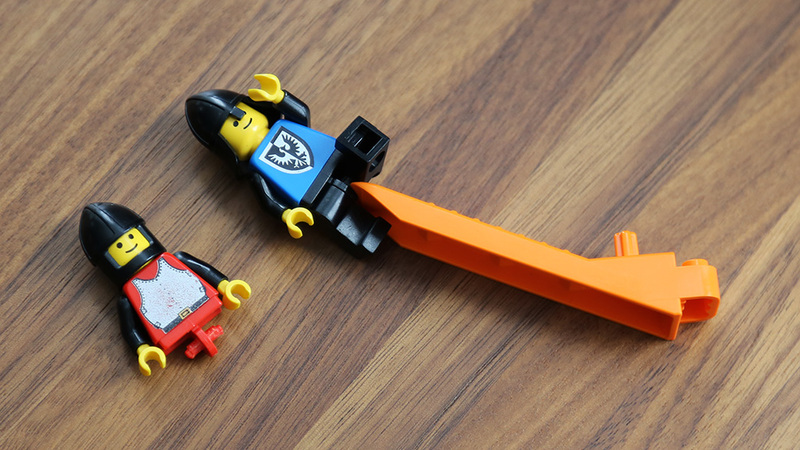 One recent example was a slightly bent 1980s minifig lance I had lying around, when my son decided to pick it up and try to bend it back. He didn’t apply almost any force to it before it popped and split cleanly in half, from the point where it had been bent during the years of storage. In another case, taking apart a partial 7835 Road Crossing resulted in one the sleeper plates breaking from multiple points. I don’t think I applied that much pressure on it, but I did bend the pieces a little and one of them was too brittle for that. Also note that the center part of these classic sleeper plates is raised a little – do not push downwards there when lifting tracks, hold the sleeper down from the flat outer edges instead. One important lesson in both cases: don’t bend LEGO, especially not if it has been damaged (and unfortunately you can’t always tell beforehand). 2. Fingernails, teeth, knives and chainsaws will scratch your LEGO as the above picture from one of my childhood MOCs points out. 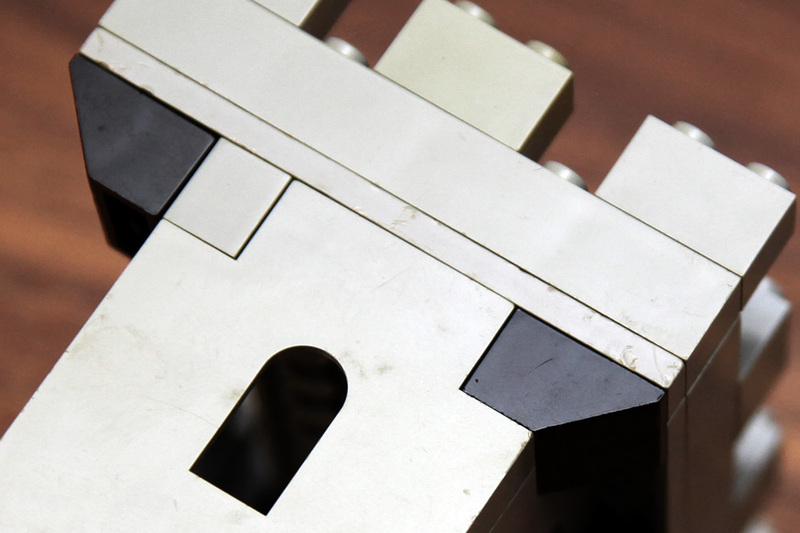 The temptation to use fingernails or teeth to separate LEGO pieces from each other can be big, but resist it – your brick collection will thank you later. Some wear and tear is unavoidable over time, but most of the scratches and bruises could be avoided by the proper use of one (or two where necessary) brick separator tools. Also, consider a set of automotive pry tools made out of plastic, they might come in handy in some tricky spots and will cause less damage than teeth and the like. 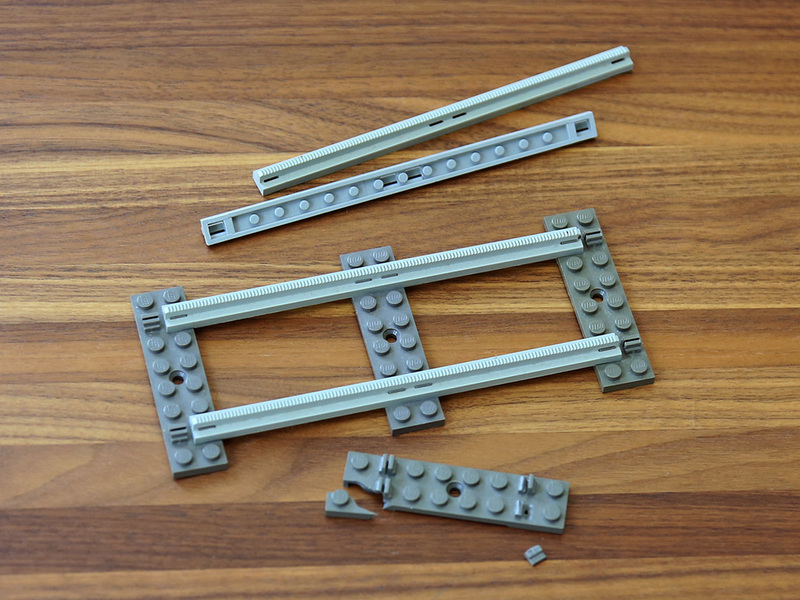 By the way, speaking of brick separators, in my experience the old green brick separator has caused a little more damage than the new orange one. I prefer the newer brick separator. 3. Cleaning LEGO can be perilous too. One recent case was the matte texture on the 7864 12 V Transformer, that I managed to scratch a little from excessive force of a wet cotton wool stick (this particular used unit was quite scratched already though). It was a soft instrument, but apparently I used too much and too pin-pointed force without noticing. I couldn’t buff the scratch out either, without causing further scratches. Seems the matte textured plastic scratches far easier than the regular glossy LEGO plastic, which can usually be wiped clean pretty hard. So, do make note of the different materials and surface textures of LEGO parts and align your cleaning methods (and the force applied) accordingly. Safe to say, don’t use abrasive materials or chemicals to clean LEGO. 4. Dismembering minifigures is a gamble. I have written at length about removing minifigure parts (see Minifig surgery and Removing minifig legs) and my experiences have been mixed. Removing arms and hands seems easy to do reliably, but leg removal and swapping seems prone to loosening the parts too much. It is actually easy to see how the pegs that the legs are connected to are rounded by the leg removal, in part explaining the phenomena. As I wrote before, this is an interesting topic that could warrant further research – is there a technique to reliably remove minifigure legs without loosening the legs too much? 5. 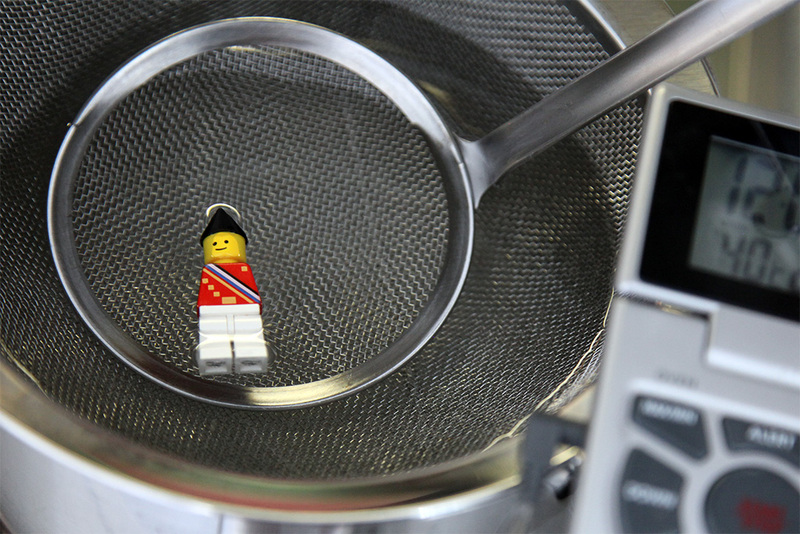 It all boils down to this: Don’t boil your LEGO. Believe it or not, but washing LEGO in 40 degree Celsius water with mild detergent is actually an officially recommended trick. AFOLs have also successfully used heated water, at below 80 degrees Celsius (the melting point of ABS plastic), to loosen glue inside LEGO minifigure keyrings. But if you do heat LEGO too much, or go anywhere near that 80 degrees, let the plastic cool in peace before pulling or bending it. Heating the plastic will make it softer and as a result everything begins to loosen up a little. At best you’ll get away with just some loosened connectors, at worst LEGO disfiguration.